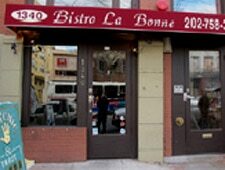 Classic French brasserie fare in the U Street Corridor. : Chef Daniel La Bonne offers French brasserie food such as a sensational onion soup with “melted” onions, loads of bread and cheese, and big, beefy flavors. Each dish beckons: beef bourguignon, roast duck, frisée with lardons, cassoulet with duck confit and smoked bacon, and grilled rib-eye, to name some of the tantalizing fare. But the coq au vin with its rich and winey sauce and fork-tender chicken pieces is truly inspired. And, of course, the classic ile flottante (floating island) with its airy meringue floating in vanilla sauce is the optimal way to end a French meal. Sadly, many of the dishes do not lend themselves to hot-weather eating, but when you find such kitchen talent, just persevere.